It's no secret that many of us turn to Google searches for medical advice, much to the chagrin of doctors who have to contend with periodic bad attempts at self-diagnosis. Google might not have a cure for hypochondriacs, but it can stop all of us from taking risks at the pharmacy: it's adding medicine to the Knowledge Graph. Search for medication and the side results panel will bring up data from the Department of Veterans Affairs, the FDA and the National Library of Medicine. Apart from a very top-level summary of a drug's role, the Knowledge Graph will show alternative names, related drugs and (most importantly) risks. The search firm is quick to warn that it's not giving us a license to prescribe our own treatment -- we'll want to talk to someone who swore the Hippocratic Oath, if there's more than a headache. 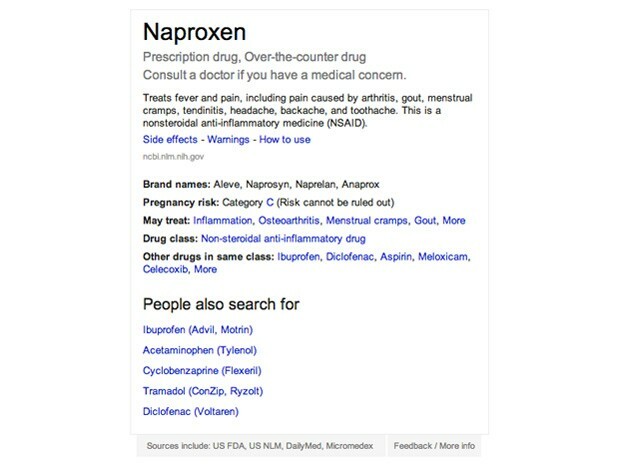 The depth of Google's new search tool could still do more to assuage worried patients than a pill bottle label.